A man who has been waiting for a heart transplant for almost a decade has made a desperate plea to potential donors. Gareth Evans, 45, from Stockport, has been waiting for a new heart for more than nine years. He needed his first heart transplant when he was just 17 due to cardiomyopathy – a disease of the heart muscle. Mr Evans has become profoundly ill during his wait and has spent the last three months in Wythenshawe Hospital, south of Manchester. At one stage he was removed from the transplant list and was forced to tell his wife and children to expect the worst. He described the moment as “the lowest point in my life”. But he was put back on the list after adjustments to his medication meant he became well enough to cope with the surgery again. He told the Press Association that he first became ill when he was aged just 16 and doing his GCSEs. “Obviously with the stress of my exams I didn’t think anything of it at the time. I got an apprenticeship, started my apprenticeship and started to notice that I was getting out of breath and I thought ‘something’s not right’,” he said. “I went for some tests and they found out I had cardiomyopathy – my heart had gone twice the size it should have been, the valves were leaking and the muscles had gone weak. One donor can save or transform up to nine lives. Mr Evans continued: “The best thing I could do to honour my donor was to lead a good, normal life. And that’s what I did. I worked hard. “I was 17 and I was told: ‘You will maybe live five or 10 years.’ And I just thought ‘I’ll earn my money, I’ll spend my money’ and that’s what I did. “But as time went on I thought ‘well I’m still here’ and then I met my wife Danielle, and we had the two boys and I thought ‘I need to start planning for my future’. Mr Evans enjoyed a 19-year long career, which culminated in him being a senior purchasing executive at BAE Systems, but he was forced to take early retirement due to ill health. “All of a sudden I went back to square one, back on the list,” said Mr Evans, who has two sons, William, 13, and Callum, 10. Mr Evans said: “The only way I can describe it is that for nearly a decade of my life I have been existing and not living. “When I took retirement I thought three years would be the worst-case scenario before I got a new heart. “If there was enough donors I’d have had a new heart by then and I’d be back to work and carrying on. “Nine-and-a-half years later and I’m still waiting. “There are not enough people talking to their families and saying ‘I want to be an organ donor, you need to know my wishes’. “If somebody saves a life while they’re living they are classed as a hero – the final thing you could do is be a hero, save people’s lives. There is nothing more marvellous than that. 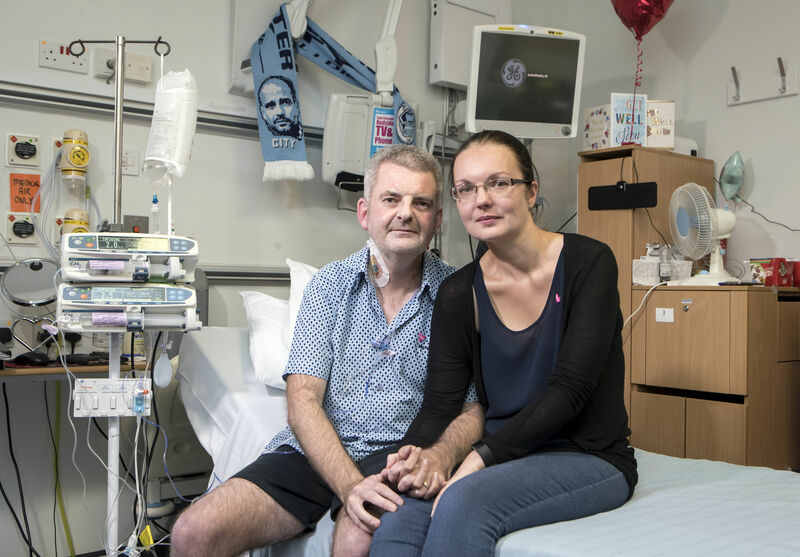 Anthony Clarkson, interim director for organ donation and transplantation at NHS Blood and Transplant, said: “Gareth has been waiting a really long time, nine years is quite exceptional. “But people are still waiting two or three years as routine and as you can see from Gareth that is way too long. “And this is why we’re trying to get the message out about organ donation. “To sign up for organ donation is easy to do via the website organdonation.nhs.uk, you can google it and it’s there, it takes two or three minutes. During Organ Donation Week, NHS Blood and Transplant is encouraging people to talk to their families about their wishes surrounding organ donation. It said that last year, around 3,000 transplants were missed because families said no to donating their relative’s organs. There are currently 6,133 people on the transplant waiting list. This includes around 280 people waiting for a new heart. Very few people receive a second heart transplant. Figures from NHS Blood and Transplant show that over the last decade, only 27 patients have received a second heart transplant.